Howl’s Moving Castle has the distinction of being one of the few films that I enjoy better than the book. It tells the story of Sophie (Emily Mortimer and Jean Simmons), who is turned into an old woman by the Witch of the Waste (Lauren Bacall); in order to reverse the spell, she teams up with a wizard named Howl (Christian Bale), who is actively avoiding military service in a war he opposes. This film has all of the hallmarks of being a Miyazaki film: rich colors, environmentalism, an opposition to war, feminism, breathtaking artwork. However, this one also manages to tackle the concept of beauty and self-perception. One of the major plot points for both young Sophie and elderly Sophie comes in the form of her perception of her own beauty. And in true Miyazaki form, the emphasis of true beauty is given to the young woman that needs to grow to trust herself and realize that her own personality adds to what everyone else sees. At the beginning of the film, Sophie considers herself too plain to be of any interest to Howl. When her sister Lettie (a nearly unrecognizable Jena Malone) tells her that she has to be careful lest the wizard devour her heart, the glum Sophie retorts, “Howl only does that to beautiful girls.” And while Lettie scolds her, the writing is on the wall both for Sophie and the audience: Lettie is largely lusted after by the general population of men in their city, as demonstrated with every make interaction with Lettie glossing over Sophie’s presence while asking what they can do for the beautiful Lettie. It’s important to note, though, that Lettie appears heavily made up, from her bright blue eyeshadow to her blush to her thick, glossy lipstick, which makes us wonder if this would be the same reaction without the makeup. It’s easy to see why Sophie would doubt herself: when compared to Lettie, she views herself as plain and practical, in everything from running the shop her father owned to her simple hairstyle, hat and dress. Sophie doesn’t like to call attention to herself, and after a while, she begins to use this to her advantage as an old lady without much to lose once the spell is put upon her by the Witch of the Waste. This doesn’t mean that she’s immune from feeling pain related to her perception of plainness, though. Sophie visibly ruffles when the Witch of the Waste refers to her as “the tackiest thing here,” choosing to set her jaw and politely ask the offending woman in a firm tone to leave the shop. Later, when Howl is having a tantrum over his botched hair, she has to leave the castle after exclaiming, “I’ve never once been beautiful in my entire life!” Her reaction is to openly sob into the rain as she lets that feeling of sorrow and low self-worth in. And you know what? It’s easy to become Sophie in that moment. How many of us feel that ugly on a daily basis? How many of us want to be the person that is seen rather than the person that blends into the background? How many of us want to be Lettie, beautiful and pursued, as opposed to plain and practical Sophie? You can smell high maintenance on Lettie. However, for someone who is supposedly so plain and inextraordinary, Sophie sure has more than enough people pursuing her. At the beginning of the film, she’s threatened by the two soldiers in the alley right before her encounter with Howl; the men come off as rapey, leering and referring to her as a “mouse” while praising how cute she looks when she’s afraid. The Witch of the Waste uses her to get to Howl, and it’s worth noting that it comes off as a jealous action: she knows that Howl has a connection with Sophie, and wants to exploit it to get to her prize – Howl’s heart. Turniphead follows her around, unable to speak but incredibly loyal. Madame Suliman even goes searching for her, knowing full well that Howl is attached to Sophie. For someone who tries her best to blend in and behave practically – from cleaning to cooking to teaching manners and jumping to the defense of someone who is childish and absent – Sophie certainly has a lot of people that are seeking her out. And Howl? It’s clear around the midway point of the film that he cares for her like no one else. The amazing part is that Howl’s attachment to Sophie is far more rooted in intimacy than it is in some sort of self-serving action of keeping her around for the sake of her providing praise. He’s not around her in order to achieve a sense of importance: he makes the elderly Sophie’s clothes look nice, and he kindly chastises her when Calcifer nearly goes out. She helps pull him out of his funk when he has a tantrum over his haircolor, literally carrying him to get cleaned up. For these reasons, Sophie becomes his rock, and he takes this bond to heart when he visits Madame Suliman, telling her, “Knowing you would be there gave me the courage to show up.” It makes sense, then that he later tells her that she’s beautiful after they’ve gone through the portal to his childhood cottage. Furthermore, he confesses later on, “I’m such a big coward. All I do is hide. I use magic just to keep everybody away. I can’t stand how scared I am.” Sophie isn’t just the pretty face like Lettie – Sophie has the substance and fight within her to truly touch people, especially a man that literally lacks a heart. This is where Sophie’s main lesson comes in. 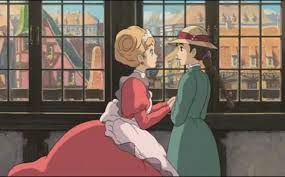 When Sophie starts letting go and feeling appreciated – such as when Howl offers the touching gesture of creating a room just like her old one at the hat shop – she manages to change into a young woman again. She ages when Howl miswords the sentiment, but then regresses in age again when she sees the fields of flowers that Howl has marked as just for her, a place he has used minimal magic to improve purely for her liking. The thought of losing Howl causes her to age once more, as she tells him, “I’m not pretty, and all I’m good at is cleaning.” She doesn’t quite believe in herself, and tells him, “The nice thing about being old is you’ve got nothing much to lose.” However, Sophie has to drop that act when the very real threat of losing Howl looms. She gives up her hair to power Calcifer, then has to do battle with the Witch of the Waste in order to reclaim Howl’s heart. The experience forces her to go on a journey that is both physical and emotional: she has to travel through time in order to discover the mystery of how to help Howl and Calcifer, and while she is left young again, her hair is still gray. However, she’s free with her affection at this point, giving hugs and kisses to the witch, Calcifer, Turniphead, and Howl in a bid to show them how much she deeply cares. So while some may argue that Howl’s love is what breaks that curse, I’m in the camp that it’s Sophie’s acceptance of both herself and her emotions. In letting go of her self consciousness, she’s able to free herself to help others. It’s sacrificing her baggage to kick to the surface and save the rest of the survivors that crashed into the ocean. I doubt they see anything but each other. Howl tells Sophie at one point of the film that he pursued the Witch of the Waste because “[s]he was once quite beautiful… Then I realized she wasn’t, so as usual, I ran away.” He ran away from someone whose soul was ugly; when faced with an old woman with an extraordinary spirit, he instead falls in love with her. That’s a beautiful message to the Sophies of the world: that someone will see the inner beauty while running away from someone who is a monster. And true to form, Sophie accepts all versions of Howl, from the tantrum-prone young man to the monstrous bird. It’s enough to give pause and ponder our own perceptions of ourself. After all, the most captivating person in this film is the one that sees herself as nothing special. Perhaps we are all Sophie, waiting to be revealed as a treasure we don’t realize is there.